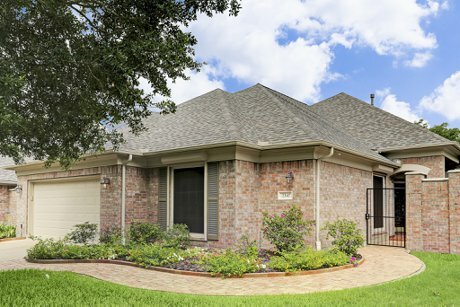 2342 Fairway Pointe Drive | SOLD in League City, TX! 2342 Fairway Pointe Drive is a beautiful Village Builder patio home located in the gated golf course community of Fairway Pointe in the South Shore Harbour area of League City. With an open floor plan and a brick patio complete with water feature, this lovely three bedroom, two and a half bath home is located in a park-like setting amidst the South Shore Country Club Golf Course. Good natural lighting and pre-wired speakers throughotu the house. Leaded glass front door. Entry with ten foot ceilings, deep crown moldings. Formal dining room located and one of the secondary bedrooms lare ocated off of entry. Formal dining room with crown moldings chair rails, wide-plank hardwoods. Large living room with custom built-in book cases and cabinets. Floor-mounted electrical outlet. Gas log fireplace. Large bank of windows overlooks the backyard. French doors leading to the study/media room. Study currently in use as a media room. Custom built-ins, French doors exit to private exterior atrium. Island kitchen with storage cabinets, under counter and over cabinet lighting, granite counters, a vented gas cooktop, built-in oven and microwave, and built-in desk. Open to living room. Breakfast area off of kitchen. Utility room, half bathroom, and garage located off of breakfast area. Master bedroom suite with two seating areas, hardwood floors, coffered ceiling, walk-in closet. View onto third hole fairway of South Shores Country Club. Master bathroom with vanity seat, double sinks. Separate shower and spa tub. Two secondary bedrooms, each with walk-in closets, are served by full bathroom in the hall. Backyard overlooks the golf course. Covered patio with three skylights for natural light, remote-control storm shutters. Gated subdivision with entry controlled by individual access codes and remote controls for property owners. Fairway Pointe is located amidst the South Shore Country Club Golf Course. Low HOA Fee of $510 per year.